31st December – New Year In with Jeni + Roger at the Wanderer’s Rest Inn. They are putting on a buffet. Fun night with fun people. Doors open at 7pm. Prize for the best costume. 9th January 2018 – Hall A.G.M. from 7.30pm. 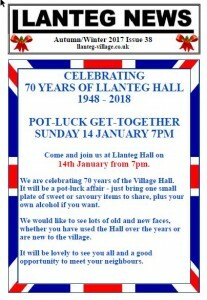 14th January– 70th Anniversary of the building of Llanteg Hall – a Pot-luck get-together – 1940s theme and dress if you wish – all welcome. 27th January – walk at Botanical Gardens with Nigel Bailey.